I know we’ve made Christmas cakes already but these are so cute I couldn’t resist adding them in to the 12 days of Christmas. 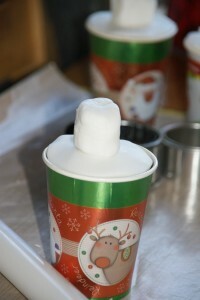 As an alternative to baking in teeny tiny tins Christmas paper cups are just the thing. 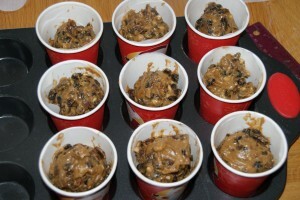 1 x 8″ cake mix will make you 8 paper cup cakes – that’s lots of presents, or lots of ££’s made at the School Fair. One of the Christmas cake kits the supermarkets are doing are just the thing – I tried out this one by Whitworths and it tastes lovely so comes with The Pink Whisk seal of approval. They also do a Stollen Kit which is worth a try too – alternatively you can use my recipe to make Stollen from scratch here. 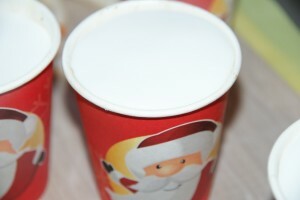 8 x paper cups – don’t go for the foil covered cups, you want the paper cups with designs printed on them. The £ shops are full to the brim with them at this time of year. Once you have your cake mixture ready to go, prepare the cups. 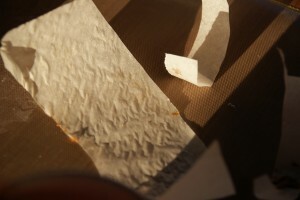 To get the paper lining to stick to the outside of the cup lightly spray with an oil spray or grease lightly. Stand the cups in a deep cupcake pan to keep them steady and upright. Divide the cake mixture between the cups and bake in the oven. Depending on the temperature (I’d recommend 140c (fan)/150c/Gas Mark 2-3) they should take around one hour – one hour 15minutes but test them with a skewer and make sure it comes out clean. Allow to cool fully before going any further. Once cooled tip the cakes out of the cups, they should come out fairly easily. 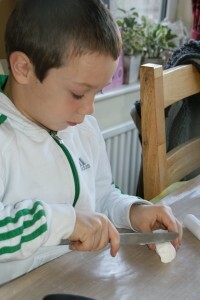 Trim down the baking paper lining so it just comes to the tops of the cake. It makes them look much neater and pop back into the cups. Roll out the marzipan on your worksurface lightly dusted with icing sugar. 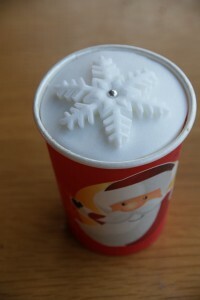 Cut out a circle using a round cutter just the right size to fit into the top of the cup. Place on top of the cake. 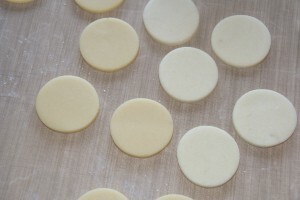 Repeat with the ready to roll white icing, place on top of the marzipan and smooth it using your fingertips so that it sits evenly in the top of the cup. 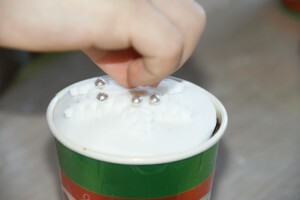 I’m finishing them off with just an icing snowflake using the cutters here and a sliver ball for a touch of sparkle! 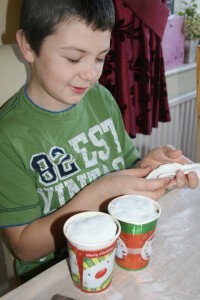 Now the boys come interfering – you do it like this Mum. Once they’re professionally finished, or not, depending on who’s done them they can be wrapped up in a cellophane gift bag and tied with a ribbon. This entry was posted in Cake, Christmas, Gifts, Kids, Treats, Twelve Days of Christmas. Bookmark the permalink. What a fabulous idea, they look terrific. It’s just a shame our Christmas market at school was on Saturday! I shall have to remember these for next year, this year’s market was awash with cupcakes so something like this will be a welcome change. 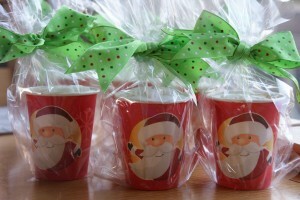 We loved this recipe at http://www.custommugs.pro, so we will do a post about it! 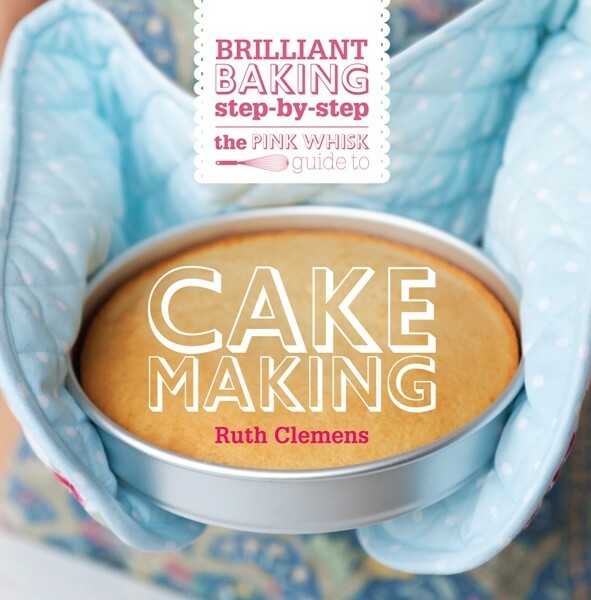 We hope out customers will bake loads of cakes following your recipe! What a clever idea. I love these little cakes, won’t be making any this year, but will bookmark for next year! Perfect pressies for work! Thanks. You’re a genius. These are pure brilliance not to mention a very funny post( love the remarks about the boys. I actually laughed out loud!)! 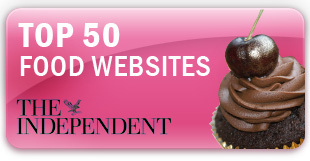 I will definitely be linking to this post in my Christmas blog round up. Can’t wait to see what’s for tomorrow! These look fabulous and just the thing for teachers presents, can I clarify, you put the baking paper lining back in the cup with the cake after you have trimmed it. Is there a reason for this? What an excellent idea! Could anyone tell me where I can find the Christmas mix pack. I have searched online and can’t find a supermarket that stocks this, unless they are already sold out. 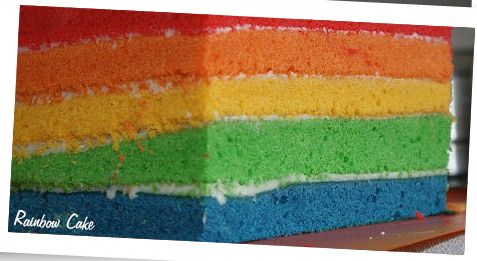 any suggestions for a cake that would be nice with marzipan and royal icing that ISN’T a fruit cake? Can you use a normal sponge mix in the paper cups?? I made these using my mum’s Christmas cake recipe as I wasn’t spending £7.50 on the Waitrose ready weighed out and boxed one when all i needed was mixed fruit. Divided nicely between the 8 cups. I made these yesterday ! 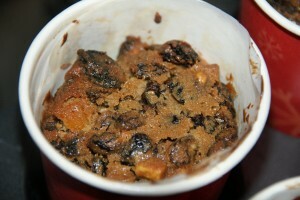 They are great, I couldn’t find the mix in the shops so made a half portion of a Christmas cake recipe. 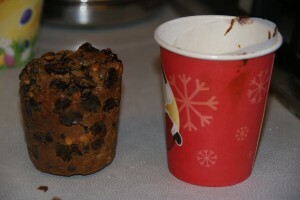 I also cooked them in plain cups then discarded the cup and slipped the cooked cake into a Christmas cup, it worked a treat! 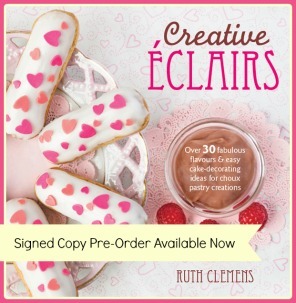 I love this idea, it’s fab! could you tell me please if you put the fruit mixture 3/4 quarter of the way up in the cup and the same for the sponge mixture? Many Thanks.